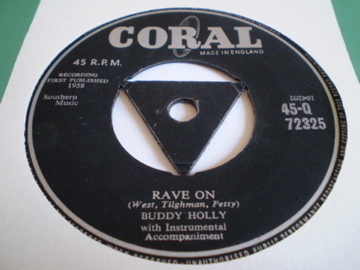 "Rave On" written by Sonny West, Bill Tilghman and Norman Petty, was first recorded by Sonny West and released by Atlantic records in February 1958. The hit version was recorded later the same year by Buddy Holly, and was one of his six songs that charted in 1958. Holly is instantly recognizable as the artist; the record begins with the drawn-out "Well..." as stylized by Holly's trademark hiccup ("Weh-uh-heh-uh-ell..."). Most of Holly's records were produced by his manager Norman Petty in New Mexico, but "Rave On" was recorded in New York by producer-bandleader Milton DeLugg. The songs title was said to be inspired by the 1956 Sun Records recording "Dixie Fried" by Carl Perkins, which uses the refrain "rave on". The vinyl has remained in excellent condition. The record shows no signs of spindle wear.